When the Lonely Planet lists ‘cool flag’ as a highlight for a country, you know you’re in for an adventure. As soon as we crossed the nautical border, gone were the English speakers, transportation and hotel options presented to you on a silver platter, and masses of tourists; in their places, our broken Albanian, unmarked furgons (mini-buses) in back alleys, and castles devoid of any visitors. Albania was a much-needed change of pace and a rewarding challenge. Allison and I decided to take a break from the coast and travel inland to tour the once mighty Albanian castles. Our route first took us through the stone town of Gjirokastra, once home to the infamous communist leader Enver Hoxa. Excited to visit our first castle, we were thrilled to discover that it featured cannons, an old United States Air Force plane, and a large field where something must have happened in 2004. We enjoyed a luxurious night in the Hotel Relax and set out in the morning to catch a furgon to Berat, a beautiful town with white Ottoman homes cascading down the hillside. We checked into another luxurious room, this time with a balcony overlooking a horse and dirty river, and immediately started up the hill to the castle. By the time we arrived, the ticket officer had all but given up on anyone visiting and had abandoned his post. As the only visitors, we slowly meandered through the ruins to the highlight of the castle: an old water cistern. Like the one in Turkey, it held water. Unlike the one in Turkey, it also held rats, garbage, and the promise of certain disease if you entered — no footbridges, cool lights, or eerie music. Like most of Albania, the cistern remains untouched from mass tourism. It’s not polished for tourists, but its real and not something you come across very often these days. Deciding we really liked Albania, we celebrated our good fortune by ordering a litre of house wine at dinner. I didn’t quite care for it, so Allison stepped up and helped herself to the majority of the decanter. She passed out immediately upon returning to the hotel while I took in an enjoyable hour of World’s Funniest Pets, Cat Edition on our sole English channel. From Berat we headed to Albania’s national capital, Tirana. Through a walking tour, we learned an incredible amount about Albania, all best relayed to you through a series of photos. 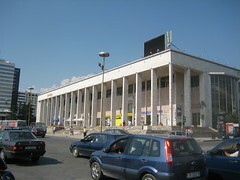 First, we learned that if you became a communist country, you would receive a building as a gift from the Soviet Union. Unfortunately the building you would receive would be rather unfortunate looking. 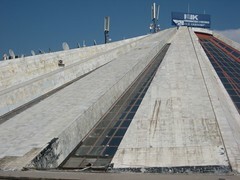 Second, we learned that if you are a communist leader, such as Enver Hoxa, a pyramid would be built as a museum dedicated to your life achievements. Unfortunately, the pyramid would be even more unfortunate looking than the building from the Soviet Union and, once your regime fell out of favour with the population, your pyramid would be turned into a nightclub called ‘The Mummy’. Third, we learned that once communism fell in Albania, due to famine or, as I theorized, due to people getting sick and tired of all the ugly buildings being constructed, the mayor of Tirana called to have the city’s buildings painted with colour to liven the place up. Fourth, we learned that in Albania, there are restaurants that look like McDonald’s, but aren’t, there are restaurants that look like Subway, but aren’t, and Yahoo!, unable to compete with Google online, has decided to branch out into the fast food space with tasty donairs. And fifth, we learned that no one seems to care if you drive around with Alberta licence plates. 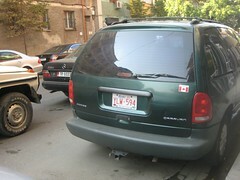 This got us thinking, if you legally owned this Dodge Caravan, why would you pay to ship it from Canada to Albania? A Dodge Caravan? Or, if you obtained this Dodge Caravan through the black-market (again, a Dodge Caravan? ), would you not remove the Alberta licence plates to minimize suspicion? To finish off our rather fantastic and educational day in Tirana, we caught an English screening of Indiana Jones and the Crystal Skull. The theatres in Canada should take note. Not only was the movie less expensive, but we were treated plush Lay-Z-Boy chairs and the option to purchase beer. The next morning, we caught a furgon in an alley for a day trip to our last castle in the town of Kruja. We took a picture of the tourist map to ensure we wouldn’t miss any of the major sites, disappointed that the Shoes Factory wasn’t worthy of a photo caption. Upon trekking up to the castle, we were sad to learn that the picture of the castle is not actually the castle, but a museum. The actual castle had all but been destroyed except for a sole tower. Fortunately, the discovery of a near-by bunker saved the day. While we saw many from the busses we travelled on, along with the creepy stuffed animals and scarecrows on the roofs of houses, this was our first opportunity to see one up-close. The bunkers, all 700,000 of them, were built during the communist regime using five tonnes of concrete and iron a piece. Designed to withstand a full tank assault, they remain as near-indestructible reminders of the past. Today they serve no real purpose, except for looking mean and/or serving as plant stands. The next day we headed to Shkodra and from there we caught a bus headed to Ulcinj, Montenegro. As the driver pulled over to buy watermelons, later used to bribe our way to the front of the border line, we felt a hint of regret for not having spent more time in Albania. As the last undiscovered Mediterranean country, it should not be missed by anyone travelling through the region. Oh wow. Love it. I have the sudden urge to both eat a donair AND search the net at the same time. Weird.